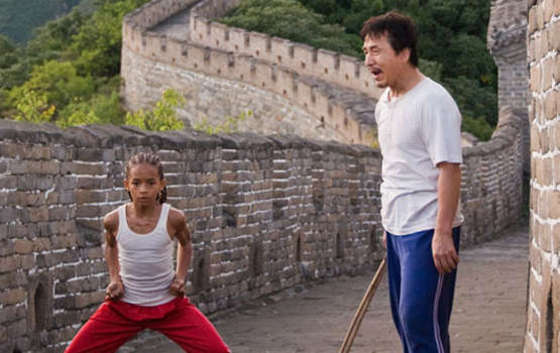 When I first hear that the 2010 version of Karate Kid was in pre-production, I must confess to having been rather sceptical. 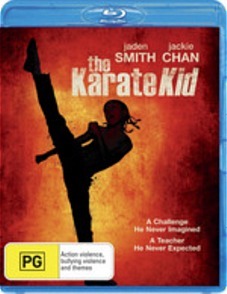 The remake appeared to be nothing more than a blatant star vehicle for Jaden ‘Son of Will’ Smith, the film was set in China and the martial art featured throughout, somewhat unbelievably in view of the title, wasn’t even karate. Besides which a remake seemed superfluous at best, given that the original is such a staple of 1980s cinema, provided career-defining roles for several of its cast members including Ralph Macchio and Pat Morita and included numerous iconic scenes that are referenced to this day (Wax on/wax off, anyone?? The Crane???). Come on! Well, I don’t think I was too far off the mark. The film is largely redundant, is certainly a shameless two-hour promotional vehicle for Will and Jada Pinkett’s diminutive cash cow and does indeed feature the most ridiculously inaccurate title of all time. 12-year-old Dre Parker (Smith) and his perpetually velour-tracksuited walking stereotype of a mother Sherry (Taraji Henson) are relocating to China from Detroit for Sherry’s work. It is never actually specified what line of work she’s in, though judging by her appearance and mannerisms she’s travelled thousands of miles to open a nail salon. Dre quickly runs afoul of some local toughs, becomes enamoured of a violin-laying pubescent hottie (Wen Wen Han), is tutored in the finer points of kung fu by a wise old maintenance man (Jackie Chan) and if you’ve seen the original, or indeed any film ever made, you know how it all ends. At 2 hours 20 the film is far too long, and at times it feels more like a Pepsi commercial than a motion picture. It is also overly bombastic and frequently self-important, creaks along at a snail’s pace, ends too suddenly and doesn’t really make a great deal of sense. That being said, I quite liked it. It’s flashy and colourful, the action sequences are expertly staged and executed, Smith the Younger is clearly a rising talent and the 21st century update on the famous ‘Crane’ move of the original is suitably spectacular. Plenty of fun, as long as believability and narrative cohesion aren’t high on your list of essential filmic elements. The film has been rather stunningly shot, and the letterboxed transfer is a fresh and blemish-free as the cheeks of our precocious young protagonist. The TrueHD surround audio is likewise without fault, and the pulsating soundtrack blares the decidedly un-Oriental likes of AC/DC and the Red Hot Chili Peppers at an appropriately high decibel level. On Location: The Karate Kid Interactive Map of China, a Featurette hosted by Director Harald Zwart which purports to reveal ‘how the cast and filmmakers captured China’s culture and history’; an Alternate Ending; a series of enjoyable Production Diaries (including A Day in the Life of Jaden Smith and The Forbidden City) hosted by Jackie Chan; six brief Chinese Lessons; a Making Of, a Music Video featuring Justin Bieber and Jaden Smith (shudder) and some Trailers. No Audio Commentary, strangely enough.